"FAMILY OWNED AND OPERATED since 1983"
What Makes Laminate Flooring the Right Choice? Did you know that laminate flooring is quickly becoming the floor covering of choice? Why? It’s healthier, more durable, and gives a luxury look at a cost effective price. Laminate flooring offers appearance of real hardwood floors or slate, but for about two-thirds the cost! Laminate flooring is an excellent choice- healthy for your family and environmentally friendly. Extremely durable and scratch resistant, it will not fade even after years of exposure to direct sunlight. You may be surprised, but laminate flooring is chemical resistant - even the toughest stain you can safely remove with acetone, with no damage to the floor. Laminate is also burn resistant- so you can install it in front of your fireplace with no worries! Even burning embers falling onto the floor will not leave any mark or discoloration. Laminate installation is so easy! The common handyman will have no problem to install it. Every manufacturer provides easy to follow installation instructions, and most new generation laminates come with easy to work with “click” glue-less locking system. 1. Scratch Resistance – You can walk on laminate flooring without fear of scratching. While the floor is not scratch proof, neither high heels nor office chairs on wheels are a problem. It is recommended to put felt pads or plastic caps under chair legs or furniture feet. You should avoid getting sand or stones on the floor at any time. This can be done by placing a mat next to the door or creating an area where people can wipe their shoes clean. Compared with wooden parquet or carpet, laminate flooring is very wear-resistant with pets. No worn-through effect will occur. 2. Fade Resistance – Laminate floors are UV ray resistant and will not fade even after years of exposure to direct sunlight. This ensures that the laminate floor you install today will look the same years down the road. 3. Chemical Resistance – Classic collection laminate flooring is also resistant to penetration by most household chemicals and organic solvents (acetone, red wine, coffee, tea, markers, etc.). What may appear to be obstinate stains such as marker, lipstick or nail varnish can be removed with a little acetone. 4. Burn Resistance – A burning cigarette that falls onto a laminate floor and continues to burn for a few seconds does not leave the slightest mark or discoloration on the floor. The same cigarette would have a negative impact on other flooring surfaces such as carpet or vinyl. 5. Wear Resistance – Laminate flooring resists a great deal of wear without showing any trace. This is due to the overlay, the top layer of the laminate floor, which contains microscopic corundum particles. 6. Impact Resistance – Due to its hard HDF (High Density Fiberboard) core board, laminate flooring can withstand sudden and localized knocks such as those created by stiletto heels, falling objects, etc. The floor can also withstand long-term local strain caused by chairs, cupboards, table legs, bed legs, etc. This cannot be said of other laminate flooring based on chipboard or normal MDF cores. 7. 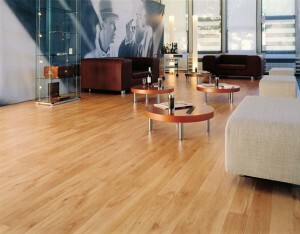 Environmentally Friendly – Laminate flooring is eco-friendly and reusable. It is easy to install and easy to take it into parts and reinstall it again. This makes laminate flooring a perfect reusable material. If for some reason your laminate floor is partially damaged you can “reuse” good laminate planks instead of throwing them away, or pass those materials on to others who could use them too! Remember, one man’s trash is another man’s treasure. Find the laminate floor that fits your needs, by looking on our laminate flooring brands page. Copyright © 2011 Burroughs Hardwoods. All Rights Reserved.